Romantic lighting or just too dark...? Am I allowed to say “bottoms” or will I be censored?! I had to say it because the hearts didn´t really make it into this dish. Big Man came home the other day with about a dozen artichokes that a pal had given him. Unfortunately they had been sitting in his truck, with daytime temperatures reaching 34 degrees Celsius for two days. They were rather sad and dry looking. I peeled away all the leaves and took out the “choke”, the hairy bit in the middle and then cooked them in water (with a good few spoonfuls of white wine vinegar to stop them going black) until they were almost tender. I was just going to use them in a salad, but then decided that as they´d had a miserable few days in the heat, I would give them a more dramatic exit! I mixed all these ingredients together, seasoned with salt and pepper and then spooned the mixture onto the artichoke bottoms which I then placed in a lightly oiled baking dish. I sprinkled them all with fresh white breadcrumbs and finished with a drizzle of olive oil. These then went into a hot oven for about 15 minutes (until the breadcrumbs were browned) and I served them with my Spicy Tomato Sauce. I think they were happy with their finale. Oh how funny …. you bad, bad girl! Hope she recovered from the trauma and let you back in soon after. I’ve never really managed to get my head around artichokes – they always looked a bit daunting! You have inspired me to give them a chance! Actually, doing them this way is easy as you just rip all their “clothes off” and don´t have to worry about trimming etc. Go on, give it a go! Great lookin’ artichoke rumps, Chica! (ha.) They really are though. I’m off to see some spicy sauce. Rumps eh, never thought of them like that but it makes them sound more meaty! Or the derrieres, the rear ends and the nether regions! I´ve started something “cheeky” here! They do go dark – but I´ve learned to live with dark green artichokes, they still tatse great! wow… you have a pal that just drops off a dozen artichokes?? I’d like be friends with that pal!! I just love artichokes!! You stuffed these “bottom” well; I’ve never used cream cheese before but I can imagine now how creamy that stuffing must be! It´s good to have pals like this isn´t it?! There is a lot of vegetable swapping going on up our mountain right now…I love it! Wonderful recipe….you bum cooker. 😉 which might have a different meaning here in the states. Lovely, wonderful…a great exit for poor abused artichokes. These look and sound delicious. Our artichokes rarely get big enough to have a choke – or even much of a bottom – as we eat them before that stage, but I do buy them as well because I love them so much, so I’ll try this next time I have some big enough ones. I think it would work with smaller ones with just the outside leaves removed. There are so many delicious types of artichoke, I adore them too! Hi Fati and thanks for your kind words! 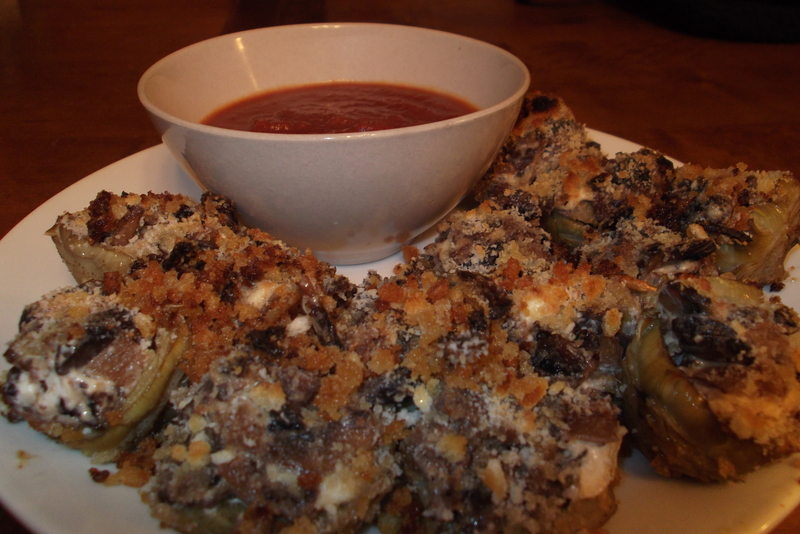 Artichokes are so versatile and delicious, I´m sure we need to put more recipes on!